Right now, physically I am talking to 16 participants, but spiritually, I am consciously talking to the whole earth and the whole universe; because finally the era has come that this value spreads throughout all directions. Currently, we live in the 21st century. I was born in 1951 which is just at the middle of the 20th century. When I was a child, I watched a cartoon called “Astroboy” with deep interest and imagined the coming 21st century. The 21st century came at my 50th birthday and I imagined that I would live during the 21st century, and how it would be a peaceful and rich society. However, 16 years have passed since we have entered the 21st century, yet it is a reality that the bond of between humans is very poor, and terrorism occurs everywhere in the world; along with ever severing environmental conditions. Currently, I am 65, and I began to receive divine messages when I was 30. Since then, I have started to see society with a little different point of view. As a result, I have a different opinion for the current crisis that has been reported in the world. At the same time, I have received various tools to analyze the current society. Originally – what is happening occurs on many levels, specifically: the personal, regional, national, humanitarian, global, solar system, and universal. Now, we have come to see that all of these levels have been activated to create the era. That is called the “Universal Point of View”, and we are always a part of the Universe. Your personal worries are a phenomena of the universe. At the same time, the solar system rotates around the Milky Way galaxy at 240 km/sec. which is also a phenomena of the universe. I see that the 21st century is not a mere continuous era from the 20th century; it is the cusp from the year 2000 to the year 3000. Therefore, now, we have just opened the door for the next 1000 years. The more we question why there is so much confusion happening in society, the more that will become the driving force to have a new era. In the same way, if each individual faces a dead-end, that is a chance to shift your life and to be reborn yourself. There are good phenomena and bad phenomena that happen in this world. The question a matter of position, and from which direction do you see the phenomena, and how do you see the phenomena. Depending on that, you can see the phenomena in this world as hopeful and also you can interpret it as extremely miserable. At the opening of the 10th session of the Earth Summit, what I would like to convey to you is that each of your lives will look totally different depending on how you interpret the phenomena. Therefore, how hopeful we can be that the world is so chaotic! In these three days, I would like to share this kind of view point with you, and find our hope in the future together by examining this chaotic era. I am wishing that you will find a breakthrough in your life. Currently, various issues have happened in the world, and in order to explore a new model of human living for the coming era, the first Earth Summit was held in September, 2010. At the beginning, university professors, company owners, a doctor, a politician, a lawyer, and religious people used to participate. In the beginning, we mainly called people who are considered to be successful people in the present era. This is because these people create and lead the present society, and they are given the benefit of wealth from it, however, originally, that wealth is for everyone. Therefore, I thought the richer people were supposed to live for the society. Then, I wanted to suggest to them a way of life for which they can die proudly when they leave their physical body and return what they have earned as repayment to society. Therefore, various successful people in the present society have come together based on that kind of call. However, the basis of thoughts of those people were, “I would like to be richer” or “I would like to justify my opinion from my position”. If that is so, I gradually understood that this type of social revolutionary movement of letting go of opinions and wealth and stand on the side of law of the universe, and return their wealth to all, would not penetrate to them. Later, the “Youth Vision Summit” was established in May 2012 with youth who were inspired by the attitude of adults who have held serious discussions in the previous summit. In the same year, the 5th session of the Earth Summit was held in November, and the boundary between generations was removed and the Youth Vision Summit and the Earth Summit were integrated. From the 7th session, the summit was mainly organized by voluntary people who resonated with the Konohana way of living which values spirit, and the participants’ diversity increased from high school students to people in their 70’s. The 9th session became the international one that had participants from the US, Indonesia, Thailand and Vanuatu. Then, through various meetings of people, we have the 10th session today. This Earth Summit is called the “Adult Summit” in Japanese. Adult means a grown-up in Japanese, and its Chinese character is expressed as a big person. It is the word distinguished from a child. However, adult here does not mean someone who is distinguished by age. Originally, adult is someone who has a consciousness to make a good contribution to this world, regardless of age. The word for “adult” has two pronunciations: Otona and Wotona. This comes from the wisdom of the Katakamuna civilization that existed in East Asia about 13000 years ago. Katakamuna people developed a highly systemized Cosmo-physics. First, the sound of O in Otona means expansion and development. It is to explore things in a big scale, and at the same time, to contract and explore small things. Therefore, O means to explore in the macro and microcosm, and to expand things and proceed. We humans have lived in the era of such a development, especially from the Industrial Revolution over 250 years ago. Also, if we consider it from the viewpoint of yin and yang, O expresses yang. Therefore, the world with physical wealth and convenience has spread, and it has been the era when physics, science and technology have been developed. On the contrary, the sound of Wo in Wotona expresses yin from the universal viewpoint. It means to take off what has been developed and expanded, sort out what is necessary and unnecessary, and stabilize. People have strong desires, so they have tried to gratify their wishes and hold whatever they wanted from the past. However, “Wotona” is someone who masters the skills to sort out what is necessary and unnecessary in a true meaning, and has consciousness to bring about a healthy society. We have had the era of development called “Otona”, so people have sought out unnecessary things and competed. Now, the era has reached its peak. Therefore, a lot of garbage has been generated, the environment has deteriorated, and people have competed, prioritizing their own ego. As a result, diseases, poverty and more confusion have spread, and we have reached the current state of the world. It was a necessary era in a sense to know the possibility of human abilities. If we learn from such experiences, we humans will be able to collaborate with others and live harmoniously, as the one with the highest ability out of all earth-dwelling beings. Now, the time has arrived when we humans should communicate with the Earth as an earth-dwelling being. That is because the capacity of the Earth has reached its limit for the expression of human desires. 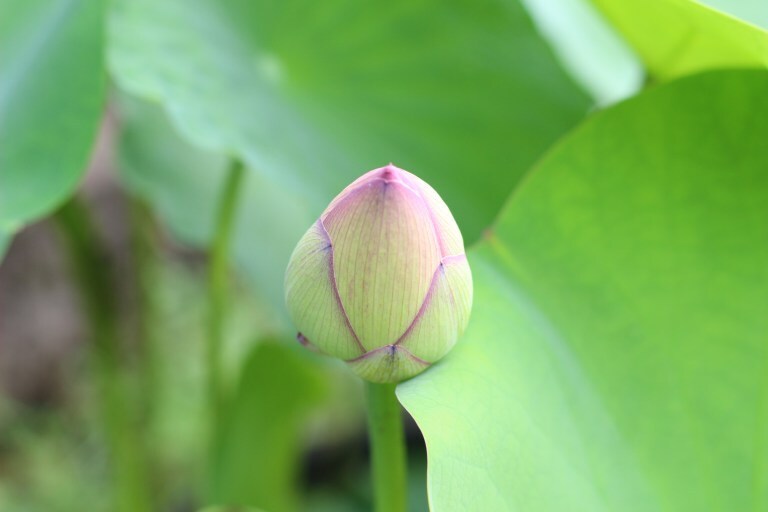 Therefore, the time has come when we should change from “Otona” to “Wotona.” In order to do so, it is essential that we have a broad worldview. Moreover, it is significant to match our will with the way of the Earth, and the universe, as the life network of the Earth. This means that we must become people with high consciousness. This is not guided by a leader. In order to create a new era, the time has arrived when each one of us becomes aware of our consciousness. We must find the will to live as “Wotona,” to communicate with the Earth, and to live in harmony with all living beings. Here, let’s take off on a journey to the universe by watching the video of a vortex. Since the sun is moving, the planets of the solar system do not draw a circular orbit, but a spiral orbit. However, for the current human beings on earth are only aware of the planets moving in a simple circular motion around a static sun. This video makes us realize the differences of those two movements. This is very important. Does the sun take the other planets along or do the planets guide the sun? Sometimes, the planets come in front of the sun. This means we can say that the planets guide the sun. In anyway, the planets of the solar system have dialogues with each other and travel in the universe. And our sun does not move in the universe like comets. It goes around the galaxy in a vortex motion. Therefore, the sun does not move straight in the space of the universe. The center of the galaxy is called the Central Sun and it is a collection of old suns. The galaxy is like a disc and our sun goes around on the equatorial plane. The sun makes a circuit of the Milky Way Galaxy in 226 million years, and it makes a spiral about 9000 time during this period. One circuit is 26000 years. Therefore, from the cycle of the universe, the decades of time that we are conscious of in our life is just a mere moment. Now, you watched the video of the sun traveling in the galaxy, and know our place in the universe based on the Copernican system. However, people in old times believed in the Ptolemaic system. Then, we, human beings entered the era for us to know about the Copernican system, common knowledge as of now is of a more complex world. In the video, one circuit of the sun is 26000 years; however, it is said 25800 in the Katakamuna Cosmo-physics. What were you doing 25800 years ago? For modern people, it is such a long time ago. However, it is just one spiral for the sun. During that period, the Earth revolves 25800 times around the one spiral of the sun. Moreover, the earth does not only rotate around the sun, but also goes through a precession around it. The axis of earth (rotaional axis) does not stand vertically toward the earth’s revolutionary plane, it tilts approximately 23.4 degree. At present, Polaris is located at the north side of earth’s axis, so even though the earth rotates it seems that Polaris does not move at all. However, the direction that the earth’s axis points is not the same all the time. The axis of earth draws an arch at an angle of 23.4 degrees in diameter to the revolutionary plane on the vertical direction and makes a circuit in 25800 year-cycle. 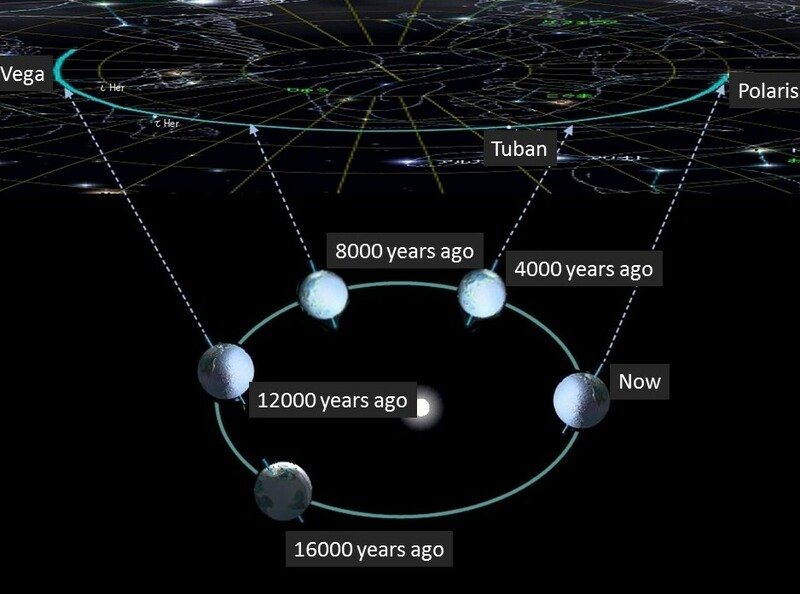 Interestingly, this 25800 year-cycle of precession movement is the same as the spiral of the sun. Moreover, Polaris is supposed to be at the same position all the time, isnt it? Does that mean that Polaris is positioned to face the earth through the processional movement of the earth? Actually, it does not. In fact, in 25800 years, there have been nine Polaris appearances. This tells people to think that Polaris is absolute; however, that absolute keeps changing. Therefore, that indicates that things that seem absolute on earth will also change. During 25800 years, one spiral of the sun is divided by four into 6450 years. The Mesopotamia civilization which is the base of current civilization, was established about 6500 years ago. Also, religions’ history is only half of that, which is about 3000 years. The earth does not go around a static sun in a circular movement, in fact the sun is moving. Moreover, the sun makes spiral movements and the earth follows it. Then, the earth vibrates, revolves, rotates, and moves in precession. On top of that, the moon follows the earth. In this way, every year, earth expresses four seasons all through the year with complex movements. How different is the thing that we believe as truth? — You will know as the era rolls by. Through the era, we have to be aware that whatever the information we get is always a process. Otherwise, our thoughts cannot catch up to the world in the same way as the universe which constantly changes and transforms. By now, a very attractive era of physical evolution has come to human beings. However, that was only a brief moment in the process of the universe. From now on, the door will open to a new set of values, and we can try to move forward. For that, we need to let go of our stereotypes. At the same time, we need to transcend our ego. As the earth rotates, one day passes, and we feel that movement. It was dark in the early morning, wasn’t it? Now, it got a bit dark and it became evening, and soon it will be night. This is because the earth rotates at the speed of 463m/sec. It is easy to understand, isn’t it? It is July 16th, today. One year has passed since last year. This means the earth has revolved around the sun in one circuit. It is easy to understand, isn’t it? Then, the sun revolves around the moving galaxy, so that orbit also becomes a spiral movement. 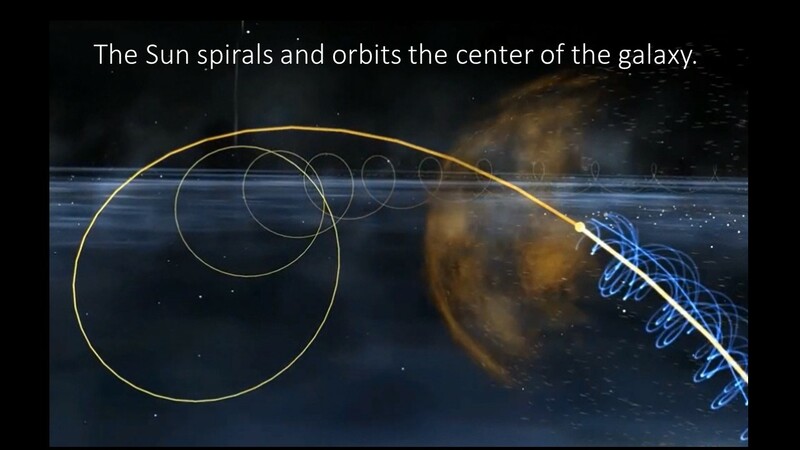 Right now, I talked about the spiral movement of the sun centering on the galaxy. In fact, our Milky Way galaxy also revolves in a galactic group. At the same time, the galaxy rotates at a speed of 240 km/sec. Here, I introduce the relationship between the Earth and Venus. This diagram describes the solar system from the direction of movement. There is the earth’s orbit. When you draw a square inscribed in the orbit of the earth, and draw a circle inscribed in the square, it will be the orbit of the Venus. And, on the other side of the sun, the conjunction, Venus and earth are aligned on the same line which comes every 1.6 years. Finally, by taking eight years, it draws a pentacle and goes back to the original position. Thus, the Venus and earth draws a beautiful diagram in the space of the universe; however, if you live on the earth, this is the world which you cannot even imagine. 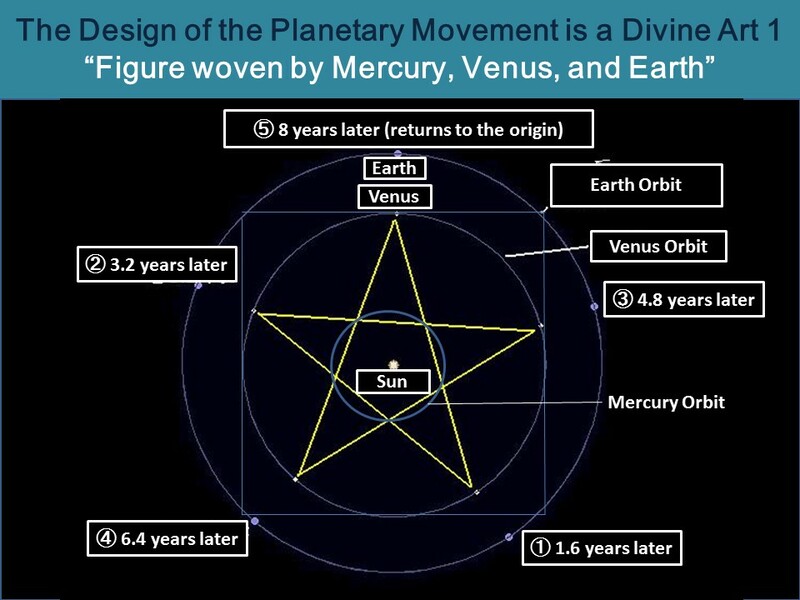 Moreover, if you connect the five points inscribed in the pentagram as a circle, it becomes the orbit of mercury. This is impossible to happen if stars do not have dialogues to confirm each of their positions. Therefore, it can be said that the stars of the solar system are a community that travel in the universe, and this is the same as when we express the community called the Earth together with all other life forms. In addition, I explain about the relationship between Jupitar and Saturn. Within the solar system, Mercury, Venus, Earth and Mars are the planets that express individual inner characteristics, and Jupitar and Saturn express sociality and community. There is a far distance between Mars and Jupitar and that area is called the asteroid belt, in there, millions of star dust (Karma) that could not belong to the planets exists. Therefore, in the sense that all of you live by transcending an individual frame in society, Jupiter and Saturn have a significant meaning. Jupiter and Saturn draw a six-rayed star over 60 years. Here, the orbit of Jupiter and Saturn is drawn, the relationship turns from a “conjunction”, where the planets align on the same line on one side of the sun, to the relationship of “opposition”, where the planets are placed on opposite sides of the same line. Ten years later, it will repeat the same relationship of “conjunction” and “opposition”, then 60 years later, it will go back to the original position. However, the original position is getting slightly out of alignment. The relationship between Venus and Earth is the same. Every eight year cycle, the position is slightly out of alignment, and does not go back to the same position. One year on the earth is 365 days. However, in fact it moves 360 degrees in 365 days, so the earth also does not go back to the same starting point, it is also out of alignment. In this way, living the universe means that you do not go back to the same position again. Once human beings got their own perspective, they are trapped by it and they do not try to change themselves. If you stay in that state, you are out of the law of the universe. Therefore, when human beings live on the earth in a trapped state, problems occur. That is why it is important to always be flexible in receiving new matters like the law of the universe or planets, and live in this moment. Overreaching the year 2000 means that the next cycle for the year 3000 has started. This means that the cycle up to the year 2000 has ended. However, most of human beings are still drawing values from the year 2000 in their minds. Therefore, the era and the earth are bringing a lot of confusion about in order to indicate the end of the cycle. Even a very small event at hand, it is in the law of the universe. Therefore, once you understand the law of the universe and live with it, problems that we encounter on earth are going to be solved automatically. On August 14th, 2015, at the 70th anniversary after the World War II, the Prime Minister Abe announced “Speeches and Statements by the Prime Minister”. On the next day, “The Earth Statement” was released as a message from the universe to the all the human beings. In order to bring true peace to the Earth, what is the thing we can do now? We can have a broad worldview and transcend the individual ego. When people are trapped in the narrow perspective of the ego, they start to sense a distance in others by differences. That is the beginning of conflicts and wars. However, the world where we exist is infinitely vast and consists of the network of various lives. That network of harmony is based on the fractal structure that the whole exists for the individual and the individual exists for the whole. When we recognize our existence this way, there are two viewpoints—a viewpoint of looking at the outside from inside of us and the other viewpoint of returning to our position from this world. The truth of this world is that everything is ONE. Therefore, there is no boundary between everything else and ourselves. If people’s worldview expands in this matter, they do not have to be trapped in the ego, sense a distance in others by differences, nor make conflicts. Peace will naturally prevail on Earth without us trying to create a peaceful world. One of the reasons why human society cannot maintain peace is that people recognize the individual ego and insist on themselves. In the current society, nations prioritize national benefits and individuals prioritize their own benefits, so peace cannot be maintained, from big wars on the national level to small conflicts on the individual level. The Earth consists of the network of life that sustains all living beings and connects them in a healthy manner. In order to do so, the law of the universe functions along with other planets. However, various contradictions are occurring on Earth right now. This situation will not bring peace to human society. Moreover, it causes the extinction of many living beings, so the environment goes from bad to worse. The cause is a narrow human worldview. Various issues occurring on Earth emerge from the human mind, which prioritizes the ego. Looking at the history of the evolution of living beings on Earth, six great extinctions occurred in the past 600 million years. The previous extinction occurred about 65 million years ago and it is said that there is a possibility of another extinction of living beings in the near future. According to the statistics, we can say that we are going toward an extinction right now. Each extinction occurs due to a different reason. There is a real possibility that humans are bringing the next extinction by going out of control. Looking back in history, the first living being was born on Earth 3.8 billion years ago. And our ancestor, Homo sapiens emerged only 200,000 years ago. This species was extremely capable, adaptable and special out of all living beings that has existed on Earth in the past. Their great ability has been proved by looking at the current world created by humans. In a sense, we humans are the masterpiece of all living beings on Earth. It is humans that have the highest ability and biggest influence of all the earth-dwelling creatures from the past to the present. However, the great human ability is like a double-edged sword. If people continue to use it for their egos, they might bring the next extinction. On the contrary, if they use it effectively, they have a possibility of bringing an advanced world, overcoming the extinction crisis that is occurring currently. We have entered the 21st century and faced some great turning points. 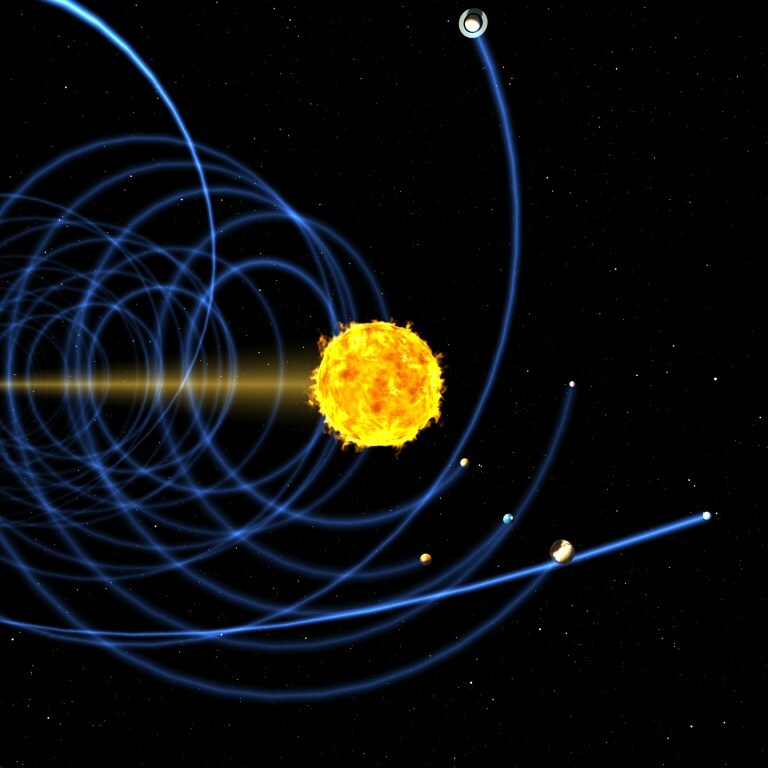 The sun orbits the Milky Way galaxy every 226,000,000 years and spirals about 9000 times in the interval. One spiral takes 25,800 years. We had the winter solstice of the galaxy in 25,800 years on December 21st, 2012 and shifted from the times of darkness and conflict to the times of light and harmony. Moreover, the Mayan calendar with the history of 13,000 years ended on that day. This means that the Mayan people who took over the civilization of TIME from the Mu continent, understood such a universal and solar structure already in the ancient times. And the Katakamuna people who took over the civilization of the soul of language from the Mu continent flourished in Asia and systematized the advanced cosmophysics. When we analyze the transition of civilizations on Earth from the Katakamana viewpoint, we are able to clearly recognize the cycle of emergence, development and disappearance of civilizations. And it matches perfectly with the modern cosmophysics and the astronomical observation data. It is 12,900 years ago which is a half cycle of one solar spiral when the Katakamuna cosmophysics reached the peak. The summer solstice of the galaxy arrived 12,900 years ago and it was the peak of light from the universal viewpoint. Then, the Katakamuna civilization that reached the peak declined and the modern material civilization emerged 6450 years ago. It became the base of the current religions and the economic system. Therefore, the values of the modern society began 6450 years ago and has reached the peak now. Furthermore, according to the ancient Chinese calendar, “the Blue Light Period”, during which kings governed the world began 6450 years ago. After the era of the kings ended, the next 3000 years was the era of the saints, called “the Red Light Period.” It was the era when people were guided by great saints. However, even though they were the same people, the gap between saints and people who were not awakened emerged at the same time. This has led to the modern system where religions govern the world. Ideologies such as capitalism and communism emerged from such a flow of the era. And people came to be commercialized by the model based on such a thought. In such an era, people lost their unique personality and happiness and values that people sought became unified, and the society lacking in diversity was created. On December 21st, 2012, we had the winter solstice of the galaxy and passed the peak of darkness with the least amount of light in one solar spiral. It has been three years from the winter solstice of the galaxy. Therefore, we have entered the times when the light has started to shine from the peak of darkness. This darkness indicates the spiritual darkness. People cannot see the truth in the darkness, so things that they thought were right and took actions have brought confusion to the society. People have insisted upon themselves and made conflicts in order to seek their own happiness. As a result, the abundance that only some people receive has created the gap between the rich and the poor and has spread poverty and conflicts around the world. Because people had no other standard of the truth, their only choice was to keep that situation even though this led to suffering. Symbolizing the era of darkness, the peak of one Pluto’s spiral came in 2008. In 2008, Pluto made a circuit of 248 years which led to the end of the Western material civilization that continued for 250 years from the Industrial Revolution. People have developed the Western science, physics and technology from the Industrial Revolution. On the one hand, people have achieved economic growth, on the other, the world population has increased explosively, ignoring the global environment. As a result, this has brought various issues on Earth. In a sense, the Western civilization has reached the peak. As a phrase, “Every tide has its ebb” describes, when the universe reaches its peak, it always declines. Now that the Western material civilization has reached its peak, the era has started when the Eastern spiritual civilization will blossom. This means two things: that we are going to shift from the times of material abundance to that of spiritual abundance and from the times of competition and conflicts to harmony. The fact that the magma of the Earth has entered the active stage, responding to the will of the sun has been guiding humans to harmony. When we face an environmentally severe era in the future, we will not be able to insist on our individual ego any more. And everyone will have to support each other to survive. In such an era, human physical desires will decrease and the world with spiritual abundance will be created. Only when people transcend their individual ego and human minds become harmonious will natural disasters settle on Earth. In such a meaning, all the phenomena are the messages from the universe to all humans. On top of that, according to the ancient Chinese calendar, we have entered the era of people called, “the White Light Period”, going through the Blue and Red Light Period. This means that we have reached the stage where each person will become aware of the truth from the stage where saints led people. In such a world, every single person is Buddha and Christ. It is the figure of humans expressed in the 21st century. Therefore, if we have a broad worldview, our ego will disappear and each one of us will be able to become a precious existence to live for this world. We have already entered the stage when each person becomes aware of the truth from the universal viewpoint. Therefore, many people have started to question the traditional values. Values of a new era are required. However, these will not be brought by traditional education. Still more, these are not what we can achieve by traditional revolutions. These emerge automatically in the transition of the times. Therefore, we should sense the change of the times, and shift and show the thinking and living appropriate to a new era. The individual spiritual revolution changes the country and eventually the world in the next era. Strong power is unnecessary for this revolution. This is the revolution by people with a firm will. Changing yourself is the beginning of changing the world. That is the universal will and the expression of the cycle of the times. Therefore, all the events that occur at the individual, national and global level are also the universal will, the flow of the times and the mission given to us. The perspective needed to read the times in that manner is possible by freeing ourselves from our individual egos and having a broad worldview. Although humans are in a physically small container of the body, we are able to reach a level of consciousness where, ultimately, the whole universe is ourselves. That is to “remove (Tori in Japanese) the differences (Sa in Japanese)” between everything else and ourselves. That is called “Enlightenment (Satori in Japanese).” The status is based on the absolute goodwill, love and harmony and the boundary between everything else and ourselves will naturally disappear. Humans are going to reach that conscious level within the 21st century. The next 1,000 years is a transitional period from the times to pursue material wealth to the times to tap the hidden abilities inside us. It is the 90% of the human brain that is yet unused which is responsible for that. If the untapped ability sleeping inside of us blossoms, the intuition to sense the universal will and the flow of the times will work and it will enable us to understand the universe without leaving the Earth. The possibility of technology to explore the universe will expand greatly then. We are able to evolve with high spirituality in addition to modern technology and material wealth as those who live in a new era. The 21st century is the beginning of the times when we humans have consciousness as an Earth being and as a universal being to contribute to this world. Now, we are facing the turning point at which we will either trigger the next extinction for earth-living beings or we will create a new era. When humans express the spirituality that the next era indicates, peace will prevail on Earth. When you read and interpret “The Earth Statement”, all the problems are solved. However, in order to do so, there is a definitely necessary thing. That is to know who we are. On this planet, there are 2.8 million of species, and when we count each of them, it is infinite. Within that, we human beings are the most superior and the most influential life on the earth. Human beings are now getting out to the space in the universe and searching for evidence of life. Existence of life what you can get there is the evidence. However, we can contact to life so easily on the earth. That means as if we are in the sea of life. There is not any idle life in that. All the life including us, human beings are interlocked by the life network and form the life called the Earth together. This life network is operated by the extremely complex and subtle relationship in there. If we could see the real form of the universe, we will be surprised at how vast, complex, and subtle it is! It is as complex as the life network that we form on earth, and each of us exists as a part of it. Moreover, there are 60 trillion cells in each of us. All the information to form our whole body is imprinted in the each cell. Since human beings have become clear of the structure, we have reached the point of clone technology. However, that does not just bring physical contribution to human beings. That indicates to of us that we are each a small universe. Each of these small universes makes a network with other small universes, and creates the universe called Earth. Do you consciously live everyday with such an awareness? Do any one of you value such a thing and live every day? No matter whether you are conscious or not, we live in such a system. We breathe. That is the circulation between our body and air. There is only one air throughout the earth. We eat food. Plants sprout from the earth. That earth is one. In Japanese, the earth is written as big (大) land (地). That means the big earth (大地球). Life is sprouting from the earth because the sun light shines on the earth and gives heat, and seeds of life germinate and grow. In that process, plants takes a role to circulate between their own body and the air by photosynthesis. This is solar power. Therefore, in a sense, we can say that we are the light. That is we and the sun are one. As a life form, the human body is 70% water. Water comes to us in the form of rain. Rain makes rivers, gives moisture to the rice paddies and fields, and flows to the ocean. This system is also controlled by the sun. Therefore, we are the sun. When we live, we encounter various occurrences. This is called the wind of life. In the same way as the wind of life, we receive wind throughout the earth. What kind of role does the wind play for our lives? We will all surely meet our last breathe, therefore it is necessary for us to connect to the next generation through producing flowers and bearing fruits. The fruits are DNA to convey information to the next generation. The fully matured fruits impose a strain to their bodies. Then, life comes in the form of wind from the very beginning just after germination, and supports the physical strength which is more than enough to support the body. That becomes the force for us to grow strong and leave seeds that connect life to the next generation. The wind that blows on earth is the same as the wind that blows in our life, and this wind is brought by the sun. Our life exists together with the sun. And, in this space —– now, we are at the foot of Mt. Fuji, Japan. The earth rotates and revolves. The speed of revolution is 30km/sec. Do you feel that wind? There is not a vehicle which is faster than that, is it? This venue existed here yesterday and also today with the sense of the earth. One day has passed since yesterday, and today, this venue still exists here, doesn’t it? That is because we travel on the same vehicle. In fact, this vehicle moves 2.6 million km/ day, therefore, with a cosmic sense, it always moves into an unknown world. Where is the place that we call earth (地)? And, where is the universe (天)? Right now, we are in Japan. If we assume that the universe is up, and the earth is down. Soon, the Rio de Janeiro Olympic games starts, don’t they? Then, where is the universe and the earth for the people in Brazil? The universe for Japanese people becomes the earth for the people in Brazil, and the universe of Brazil becomes the earth for the people in Japan, doesn’t it? 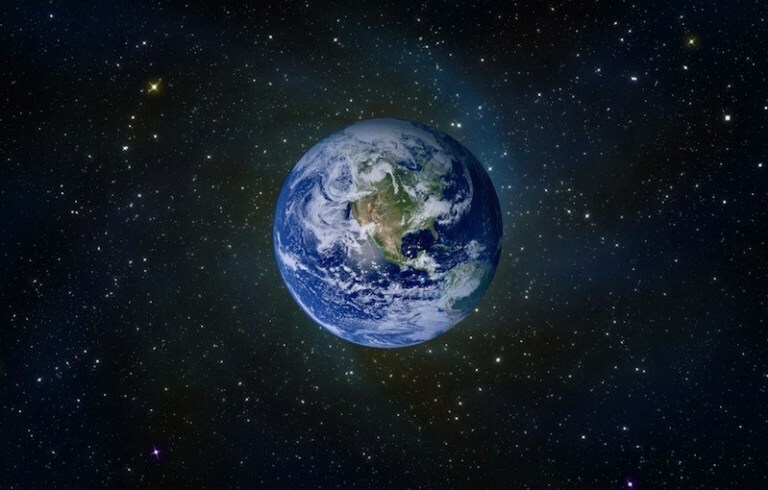 Earth means the direction towards the center of the universe, and Ten (天-universe) is also Ten (点-a dot). In terms of Katakamuna, these are the same meanings. Ten (天-universe) is the collection of Ten (点-a dot). Now, assuming there is a dot here. This dot moves 30km/ sec. If so, the diameter of the earth is approximately 12000km, so it takes 6 minutes 40 seconds to move from end to end of the earth. Even now, while we are talking like this, this dot moves throughout the earth. We live based on one sun, one earth, one water, one air (space), one wind, and the five fundamental elements of earth-water-fire-air-ether. And we ride on the vehicle (the earth) and travel (space trip). Within there, based on sun light, our lives are harmonized and coexist. The base of all of us is one. If you go back there and see each one of us, peace will naturally come to the earth. The other day, the national referendum was held in the U.K. for leaving from the EU, and in Japan we had an Upper house election. Now, many people fight in one frame of mind and they consider whether or not what you resonate with is right. This is the self and ego. There is almost no one who does not run off of this structure, and the mind that thinks I am right creates this world. We, human beings have a different ability from other lives. That is the ability to specify oneself. Then, we can measure the world from our own scale. That is a wonderful ability; however, the important thing is that the position of one’s scale is one. And this world has an infinite scale. This world is a network of that scale. However, when you think only that your scale is correct, you become a source of problems. Please look at the current world. There is correctness for both parties behind the phenomena called conflict. That is the conflict between correctness and correctness. In this sense, the correctness expresses is superiority, and what those superior people create is a world of conflict right now. The era entered into the 21st century, and from here, where should we move forward towards the year 3000? To look at this world with this scale is a given ability for us human beings, therefore, no one can deviate from this system. However, the scale of oneself is just one of many scales. Now, each one of us is asked if we can see the world by transcending our own scale or not. “Enlightment (Satori in Japanese)” means “Remove (toru) the gap (sa). The opposite of Enlightment (Satori) is “there is a gap”. Having a gap means that the self and others are different. In order to remove the gap, you need to find the common points within each other. That is we are all human beings, life and form one life called the earth based on one sun, one earth, one water, one air, and one wind. Then, you exist as a unique being. Once you realize your being is one of the pieces of a big container, we will see that we create this world together with all other beings. Then, naturally, peace will prevail on earth. Peace is not something that you create. That is not something to search for. Who are we, and what do we see? If we understand this, then all of the problems of this world will be solved. Then, this world will transform into a peaceful world immediately. We just need to remember that we are life. We are life, people on earth exist in the universe. Then, we have arrived here in the life network which has been infinitely weaved. We have already had information embedded inside of us, once we could awaken the physical and spiritual DNA in us, we will remember who we are right away. When you take in new knowledge, it may react with rejection. However, this is just simply to remember what had been sleeping or forgotten. Therefore, this is called “Awakening”. No rejected reactions occur to this. That means that you return to your true self. Every time we offer a graduation concert to care guests, Isadon, a main coordinator of the natural therapy program, gives them a message for their departure toward a new life. This time, his message was sent out not only to T-san, but also to the whole of humanity and the universe. When T-san came to the Konohana Family to take the natural therapy program, she had desires to control her life as she liked. During the first consultation, I said to her, “that is an expression of the era from my viewpoint.” However, many people have not realized this yet. The reason why the Konohana Family has been practicing this kind of lifestyle is not because we want to live like this. When the era shifts, a role to show this lifestyle as a model for a new era was given to us, and that is way we have been playing such a role. It cannot be understood from a viewpoint to gratify individual desires. A terrorist attack occurred in Bangladesh on July 1st. Not only that, many terrorist attacks have occurred everywhere in the world such as Iraq, Saudi Arabia, and Indonesia between July 1st – 5th. It is said that many of them were the work of Muslims or terrorists who have received Islamic influence. However, is it true? Let me pick up a perspective. The Japanese media have broadcast that the Japanese victims of that terrorist attack in Bangladesh were socially great people who have contributed to developing countries very hard. I do not mean to criticize that, but I have another perspective. The purpose for support by the Japanese NGOs in developing countries is business. Also at this time, the people who were involved in companies under the support of JICA made a project to organize the traffic network in Dhaka. Surely, they and local people would have hoped that Bangladesh will become a rich country with an organized traffic network like Japan. It is merely financial and physical abundance. I have watched TV programs not only about international news but also about Japan for the past few days. In Japan, about 30000 people have committed suicide every year in the past 10 plus years. In addition, care for elderly people has become a big issue. Although there are so many people in the world, many people die alone. More shockingly, many people have killed their elderly family who needed care, especially recently. That is, people take care of their elderly family and end up killing them. Japan is a financially developed country, but in a sense, it has prioritized money and materialism too much. At the same time, the reality is that Japan has a very high poverty rate. On top of that, Japan has the longest “unhealthy lifetime” which is the period from sickness to death, among all the developed countries. I believe that the Konohana Family’s lifestyle itself is a way to be able to solve various issues in the modern era. When I was watching the program about the murder of elderly family members who needed care, I thought the elderly members in the Konohana Family will not encounter such a situation. They are given an appropriate role and live very vividly the way they are. Then, I have become convinced of the importance of our lifestyle. It might be difficult to see it if people see it superficially, but I have reaffirmed that lots of solutions are everywhere throughout this lifestyle in order to face a new era. 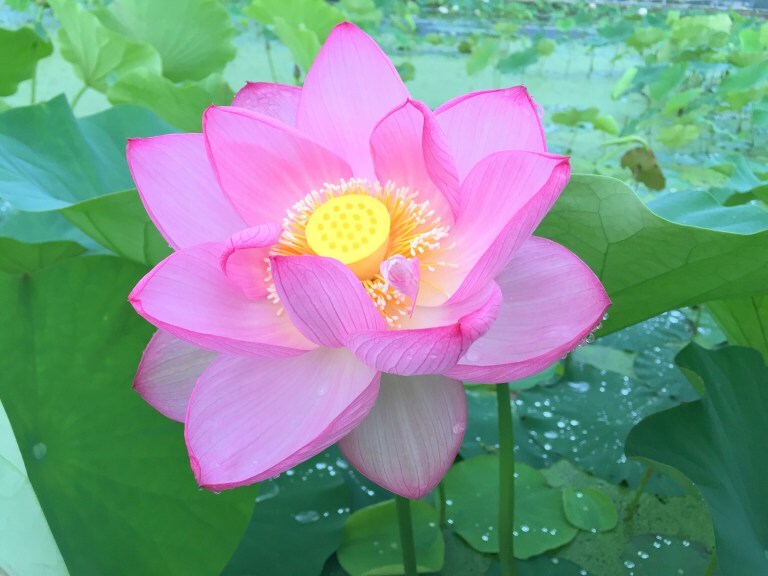 When T-san visited the Konohana Family and had the first consultation, I said to her, “Your symptoms express the era.” Actually, all the phenomena which we encounter in our life express the era. Everything, good and bad creates the era. We can keep what is considered good the way it is. 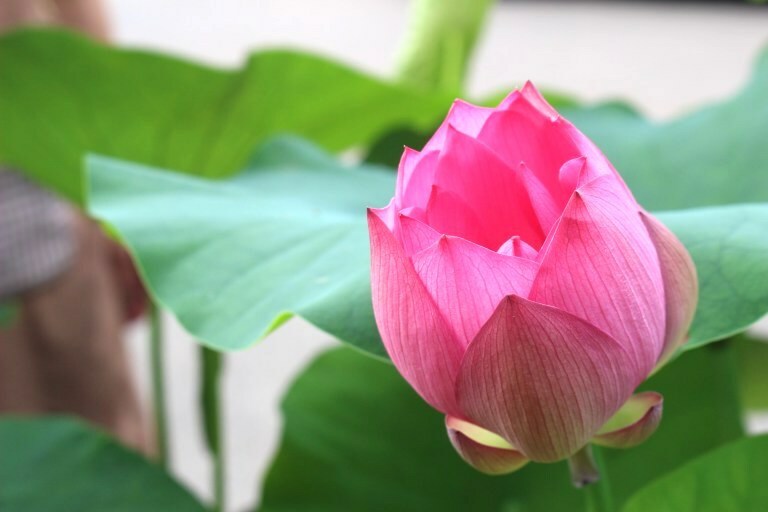 However, as for events which we feel uncomfortable, unless we understand their meanings well, and utilize them in our life, more negative eras will be created. Only when people realize that light exists on the opposite side of negativity, can they return to the light anytime. I saw light inside of T-san through taking care of her pathological symptoms. Her excellence was of the 20th century type, and she has utilized it in a Western way. As a result, this has given so many contradictions and stress to her body and mind. With this, she cannot be a model for a new society. Therefore, I wanted her to overcome it and become light for many people in a similar situation as hers. Originally, everyone is precious and excellent, so I always want every single person to utilize it in a new era. The era is already over when some excellent people lead the rest. I have realized this, so I have maintained the Konohana Family so far. Now, I am taking this path together with people who have resonated with it. The human value shown in the 21st century has not been known fully in the world yet. So, I want T-san to become a person who spreads this value together on earth from now on. Right now, I am talking to about 100 people here, but I am spiritually talking to any existence, being aware of the whole humanity, the earth, and the universe itself. That is because the era has arrived when this value will spread finally. Therefore, the activities of the Konohana Family is not for anyone. The time has arrived when the universe requests it, and we should express it naturally. New messengers emerge when the era shifts greatly over the course of human history. They are diverse, like messengers for destruction or to show a new order. We can see this in the current era through various phenomena. T-san’s severe case of depression appeared in order to create a new era. However, if she cannot see its depth, and she considers her symptoms just as a disease, there is just one patient with depression in the world. Also now, it seems like the whole human society has been depressed, and the cause of depression exists everywhere in Japan, the US, Europe, and the Middle East. The earth has physical symptoms such as environmental destruction, and its life force is expressing depression as contradictions toward it as our human body does. As a matter of fact, the autonomic nerve of the solar system is the Sun. However, now that the sunspots are functioning abnormally, the activities of the earth’s magma have been abnormal. 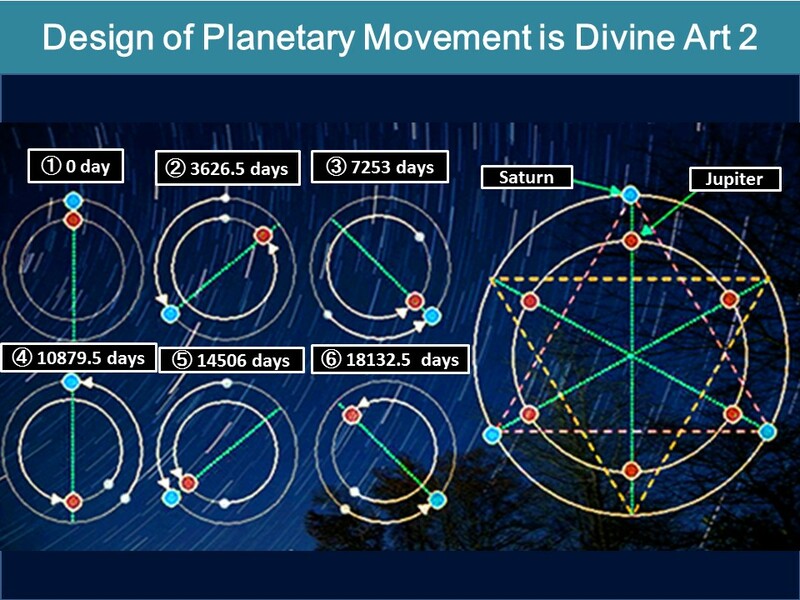 In this manner, the era moves along with the planetary movements. The era when we humans live along with the era and planetary movements will be expressed in this millennium from 2000 to 3000. The 21st century is the era when humans become aware of this truth. Humans have considered gratifying their own desires as abundance and sought happiness in an extension of that. All the social components such as politics, economy, religions, education, and medical treatment have been developed under such a value. That is why, no matter what conventional method humans use, they are facing a situation where they cannot find a solution anymore. What would be a breakthrough for this? The answer exists in that humans will realize how the universal structure is and what relationship humans have with the universe. In fact, all the information pertaining to these subjects has been sleeping inside of us. However, if we are tainted by our ego, we cannot wake up from there. This is a condition where individuals are trapped by the “dictator” of ego. Are we going to be trapped in the small “dictator” of our own ego, and bring contradictions into this world without living in harmony with other people? Or, are we going to learn such silliness, remove the frame of ego, and release ourselves toward the great “dictator” of the universal law? Becoming aware of this truth is the hurdle given to each one of us who lives in the 21st century. If we release ourselves from our ego, we will become the universe itself. When we shift from the era of physical-like, two-dimensional thinking in the 20th century into the three-dimensional one, the 90% of our brain which has been asleep for such a long time will become utilized finally. This is a world which cannot be interpreted by the conventional two-dimensional thinking based on profit and loss, or good and bad. When we come to utilize our three-dimensional brain, extremely extraordinary ideas will come out. Moreover, even if we are on earth, we will be able to understand the universal reality instantly. On top of that, the flow of things will become dramatically smooth, and truth will come out. This is the society where humans living in the 21stcentury create. Truth is not gained based on knowledge. Truth is what comes out to people who are able to see what humans should originally see, and is expressed in their way of life. And every one of us has a potential to receive it. Now, the time has arrived when the earth takes a new step into the universe along with human awakening.